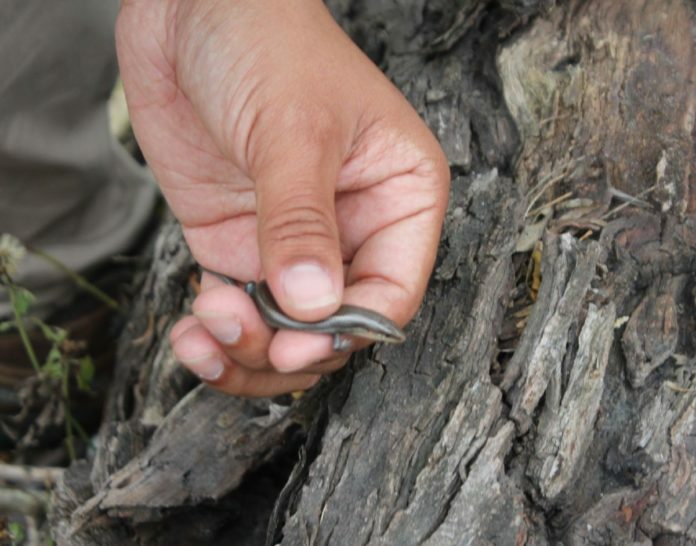 Ernest Herrera holds a Four-Lined Skink on his hand during the Bio Blitz event Saturday, March 3, 2018, at the Santa Ana Wildlife Refuge in Alamo. ALAMO — Looking to preserve the biodiversity of the Rio Grande Valley, volunteers from both sides of the border have been working to document as many species as possible. Last Saturday the group gathered at Santa Ana National Wildlife Refuge to participate in the Border BioBlitz, a one-day binational science effort to record as many species as possible along the 2,000-mile U.S.-Mexico border. The group Saturday was made up of about 50 naturalists, citizen scientists and members of the public that showed up to explore the refuge and survey the plants, animals, fungi and other organisms of the borderlands. The group’s documentation included photographs and a summary of the organism. The information collected will be posted to an online database and used for educational purposes and studies, organizers said. Stefanie Herweck, BioBlitz organizer and a member of the Lower Rio Grande Valley Sierra Club, said the project will display what the refuge has to offer. Plans by the Department of Homeland Security to expand border barriers throughout the area, including at Santa Ana, spurred some of the volunteers to become involved in the survey. The survey undertaken near Alamo was one of 10 similar events being held along the U.S.-Mexico border, and the only one in Texas. Other locations included the Tijuana River between San Diego, California, and Tijuana, Baja California in Mexico where an existing border wall stretches into the Pacific Ocean and several spots near Sonora, Mexico, on the Arizona border in coordination with the Coronado National Memorial in Arizona. Santa Ana, which is located off Military Highway near South Alamo Road, is known for its biodiversity and is called “the Crown Jewel of the Wildlife Refuge System” because it features so many species relative to its small size. Raziel Flores, wildlife naturalist, said she wanted to document as much wildlife as possible for the interest of the community. La Joya resident Betty Pérez owns a ranch north of the city said she loves nature and raises native plants in her own nursery. “I love Santa Ana; I grew up here in the Valley and came here when I was little.” Perez said. “It’s important because so little of old native habitat like this exists anymore. You don’t find places that have old trees and old vegetation. “We have to really take care of these places that were losing, it’s our sense of place and where we’re from and this is where our predecessors came from,” Perez added. For more information on the binational BioBlitz project and how you can be a part of this project, visit, www.inaturalist.org/projects/border-bioblitz.